When Virgil Abloh launched Off-White in 2014, few could have predicted the Chicago-based designer’s meteoric rise in the world of fashion. In that short period, he has become a regular on the Paris Fashion Week schedule, showing collections that blur the lines between traditional luxury and streetwear; launched a groundbreaking collaboration with Nike; and, as was announced this morning, been appointed the new artistic director of Louis Vuitton’s menswear line. Perhaps even fewer would have predicted that fashion’s zeitgeist would be how it is today. Kim Jones, Abloh’s predecessor, played a role in this, engineering an unprecedented collaboration between Louis Vuitton and Supreme, and Demna Gvasalia went from Vetements, a label only a handful of seasons old, to creative director of Balenciaga. Similarly, Alessandro Michele was plucked from relative obscurity and handed the reins at Gucci. While each of these moves hinted that fashion’s tectonic plates were shifting, today’s appointment is perhaps concrete proof of a new dawn within luxury fashion. The appointment will divide opinion – Abloh nearly always does. To many of fashion’s traditionalists, Abloh represents a “lack of true innovation, paucity of design” – as fashion writer Angelo Flaccavento recently commented in System magazine. Likewise, Raf Simons is not a fan of the brand, commenting on its lack of originality in an interview with GQ last year. Much of this stems from Abloh’s design approach. He gleefully declares “Duchamp is my lawyer”, while creating collections that borrow concepts and motifs from various cultural spheres. For him, originality is not the point – the magic lies in his clashing of multiple reference points. 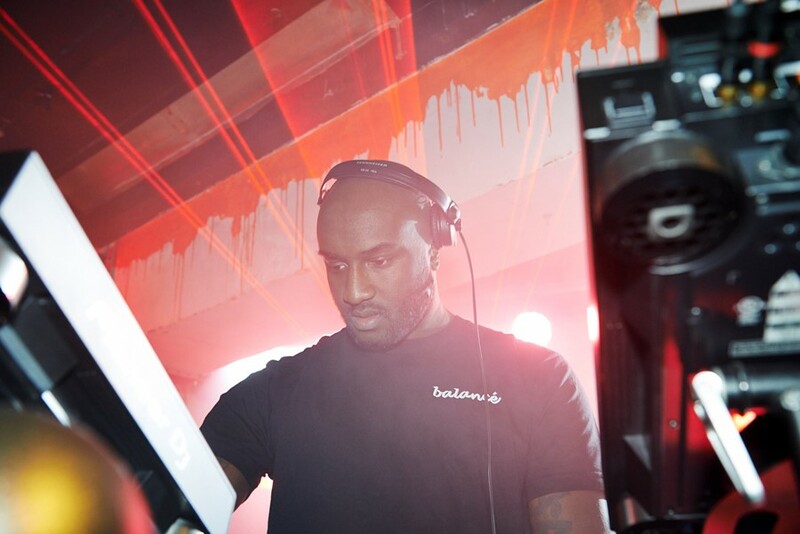 "This grey area Abloh has occupied until now is partly why he named his brand “Off-White.” He regularly talks about it existing in a space between two traditionally disparate worlds, that of luxury handbags and screen-printed t-shirts"
This approach has also seen him gain a host of influential celebrity fans. If the internet has caused something of a cultural flattening, eroding the divisions between different cultural stratas, from haute to underground, then Abloh’s brand embodies this. And in an Instagram-era where eye-catching, instant recognisability is everything, the endorsement of traditional industry gatekeepers isn’t required to make an impact in fashion. This grey area Abloh has occupied until now is partly why he named his brand “Off-White.” He regularly talks about it existing in a space between two traditionally disparate worlds, that of luxury handbags and screen-printed t-shirts. At Vuitton, he’ll be expected to meld the two, in a way that’ll probably prove just as polarising as his own label currently is. “It’s all a résumé. I want to design for a house,” Abloh said of Off-White in 2016. Recent successful collaborations with Nike, and a slated one with Ikea, will likely have convinced LVMH that while Abloh’s work may be divisive, it’s impactful and sells extremely well. Today’s news is also significant for its timing. As fashion begins to finally, albeit slowly, face up to its chequered past with race and representation, the appointment of Abloh, an African-American, at a storied Parisian house is important. Only two other black men have held such positions at houses of similar stature – Ozwald Boateng at Givenchy (where Abloh was rumoured, wrongly, to be headed before the appointment of Clare Waight Keller), between 2004 and 2007, and Olivier Rousteing at Balmain. From Gucci’s initial bungling of a tribute to Dapper Dan (as part of its 2018 cruise collection) last year, to Chanel’s AW91 hip hop inspired collection, complete with chunky gold chains, fashion has a long history of borrowing the ideas and aesthetics born of black creativity, to serve their own ends and profit margins. A similar notion – this time about women and reckoning with the politics of power – was acknowledged by Nicolas Ghesquière, the Louis Vuitton creative director, after his recent AW18 womenswear show. “I have these discussions about #MeToo everyday. It's a dialogue we have all the time,” said Ghesquière. With this in mind, it will be interesting to see whether Abloh continues to champion the stylist Ian Connor – a regular backstage at Off-White shows, a former campaign model for the brand, and someone the designer regularly acknowledges on social media. As Amber Rose claimed last year, Connor has been accused of sexual assault by 21 different women. As of today, Abloh is no longer an unaccountable fashion outsider; he now wields the power and influence of one of the most coveted positions in LVMH's portfolio. Above all, this appointment seems like it may have radical consequences on how we perceive the role of creative directors. Just last week, James Jebbia, the owner of Supreme, was nominated alongside Abloh and Raf Simons, for the CFDA’s ‘Menswear Designer of the Year’ award. Jebbia is not, nor has ever claimed to be, a designer. Abloh, although a formally trained architect, also has had no traditional schooling in fashion design. (Neither does Simons, for that matter). Yet, these three are amongst the most influential “designers” in fashion today, their brilliance judged in terms of cultural impact. Louis Vuitton’s AW17 collection was not memorable for its slick tailoring – which it had – but for its brash, instantly-Instagrammable Supreme collaboration. This is why they have hired Abloh, a designer adept at cultural-bricolage and creating true spectacle – and increasingly it would seem that such qualities are what luxury brands look for in their creative directors. “This show – being in Paris and showing a collection and everything – is all triggered by that decision to print one t-shirt,” Abloh told Dazed in 2016, the day after his debut menswear show at Paris Fashion Week. He was speaking of his ‘Pyrex 23’ t-shirts, an art project which preceded him launching Off-White. “Instead of leaving it on Illustrator on a laptop, it’s like, just go out and do it.” From printing a t-shirt to showing at fashion week, to overseeing menswear at Louis Vuitton. Even then, Abloh made it sound so simple. He is a master of branding and shaping narratives. For a creative director in 2018, that is as important a skill as any.